Both Gage and Pines produced a series of Scimitar-form pins. Other makers, including Kalo, also created sword-shaped pins. The ones by Gage and Pines reflect their customary use of wirework and bead ornament, freeform semiprecious stones, and heavy oxidation. 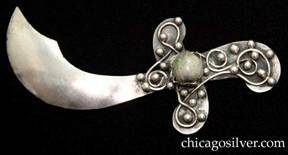 Brooch / pin, scimitar form, with freeform silver wire and bead patterns and bezel-set green and white bead on oxidized hawksbill pommel, curving pointed polished blade. While the other pieces shown here all contain semi-precious stones, the bead on the handle of this pin is actually a small bean. Brooch / pin, scimitar form, with freeform silver ropelike wire patterns and bezel-set oval coral, jade, and rose quartz purple stones, and curving pointed polished blade. A very nice example.